China soon to be the company's biggest single market ahead of Germany, U.S. and U.K.
INGOLSTADT – Volkswagen AG's Audi division aims to continue expanding even if it achieves its goal of selling 1.5 million cars a year by 2015 and becoming the world's No. 1 luxury brand. "Of course we don't want to stop there," Audi CEO Rupert Stadler told Automotive News Europe Executive Edition in an interview to be published Tuesday, February 22. Stadler said Audi has other key targets as part of its strategic roadmap. "Profitability is one of them but not the only important one. Customer satisfaction and quality are other important goals. We want to become the most successful premium brand and this means that all these targets have to be 'premium,'" Stadler said. Audi urgently needs more production capacity within the next four years to reach the sales goals. Stadler said. "In Hungary we will add an additional capacity of 125.000 units as of 2013. This year the Audi Q3 has its run up in Martorell in Spain with a maximum capacity of 100.000. And we will make a decision on an U.S. facility until 2015." 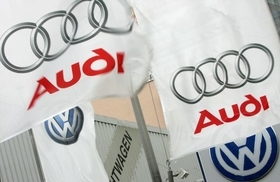 Stadler said China will be Audi's top market with Germany as number two and volume increasing in the United States. "I think that our volume in the U.S. market can grow 50 percent over the next five years and that we can reach 200.000 units per year after 2015." The UK will be Audi's fourth-largest market, followed by Italy at number five, Stadler said.